Can an invasive species be repurposed as an invasive species? It's an ambitious goal, and we love it because it honors the king of Kaijus. Imagine building a 40 foot scaffold for an invasive plant species can take over. I'm thinking it would be the greatest time-lapse video ever!! Well if it is gonna happen it will have to be funded first. Chris Lindland and team Kudzilla are quarter of the way there. Read an excerpt from a local artoicle below and watch the Kick Starter promotional video. 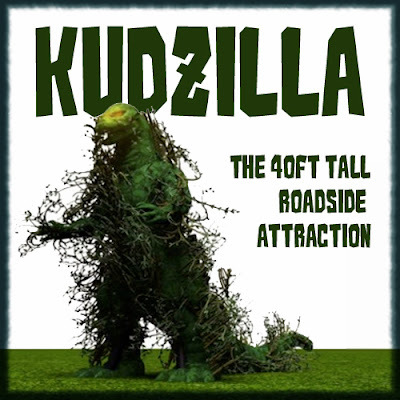 For many homeowners and gardeners in the Southeastern United States, a difficult-to-eradicate kudzu infestation is terrifying enough without the involvement of a toweringkaiju. But thanks to a new Kickstarter campaign from Chris Lindland of San Francisco-based online clothier Betabrand, such a creature — a 40-foot-tall beast that not even gallons of glyphosate solution or a herd of ravenous goats can destroy — could potentially rise from a vacant, kudzu-infested lot somewhere in the greater Atlanta area. And depending on how well said Kickstarter campaign goes, this edible invasive speciesabomination known as Kudzilla may also be capable of shooting flames from its mouth and waving its elephantine limbs at any pulaski-wielding citizen who dares to cross its path.